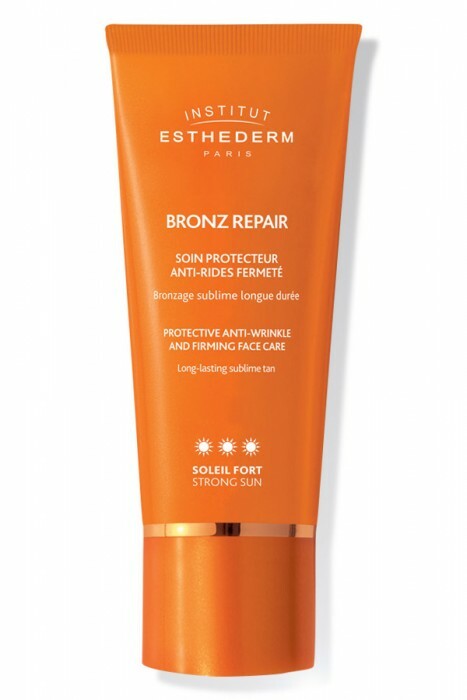 Bronz Repair Strong Sun is an anti-wrinkle suncare product with a firming effect. This soft, lavish cream stimulates tanning, prevents photo-ageing, corrects wrinkles and firms the skin. Maximum protection against UV rays: UVA protection is just as high as UVB protection. Activates the natural pigmentation process for a luminous and long-lasting tan. Prevents and corrects wrinkles: the skin stays firm and toned. Sun-tolerant skin that tans quickly and rarely gets sunburned. Product reserved for strong sun exposure (mountains, sea, tropics) or extended exposure. Apply generously on your face and décolleté 20 minutes prior to sun exposure. Re-apply every 2 hours. Skin that’s naturally protected, glowing with health and firmness. A beautiful tan and preserved youthfulness. A recommander pour la mer. Produits solaires esthederm : extras!